Elizabeth puts the finishing touches on a bridal client. Serving the areas of Los Angeles County, Los Angeles, Hollywood, Beverly Hills, Glendale, Culver City, Palos Verdes, Torrance, Santa Monica, West Los Angeles, Pasadena, Sierra Madre, La Cañada, Tujunga, San Fernando Valley, Studio City, North Hollywood, Burbank, Sunland, Van Nuys, Sepulveda, Sherman Oaks, Encino, Topanga Canyon, Canoga Park, Malibu, and others. Copyright (c) 2007 Elizabeth Dahl. 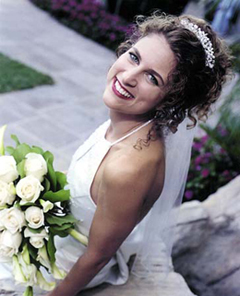 Elizabeth Dahl has over 15 years experience as a professional Makeup Artist. 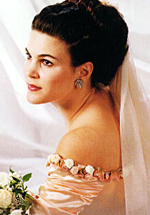 Elizabeth brings her expertise in all aspects of makeup artistry to you on your wedding day. Complete the consultation request below OR call to inquire about how she can help you achieve your best.